If the Runner accesses a single card twice during a run on HQ with Obelus, how many cards do they draw? Two cards. The Runner is considered to have accessed two cards even if they end up being the same card. If the Runner accesses cards from another server during a run on HQ or R&D, such as through the ability on Hades Shard, does the Runner draw cards for those accesses as well? Yes. Those cards were accessed during the run, and the ability does not stipulate that the accesses must be from the attacked server or its root. Step 3: Draw your deck after the run ends. This is a wonderful console for tag-me Anarchs and a good counter to the tag heavy meta we find ourselves in. An Obelus, more commonly referred to as a division sign, comes from an Ancient Greek word for a sharpened stick or pointed pillar. Interestingly, before its mathematical implications, this sign was used in texts to mark passages believed to be corrupted or false. Such passages were marked as such to be deleted, or censored, in line with the conspiracy theme. Seems to fit fairly well with Omar. the increased hand size means you can go tag-me against kill decks & simply draw up to an enormous number of cards, good against Midseason Replacements & Hard-Hitting News. Importantly, one Hard-Hitting gives you enough hand size to survive BOOM! The obvious synergies with Obelus are the Anarch viruses that scale the number of accesses with every successful run: Medium and Nerve Agent. If you hit a central server three times in a row, you'll only draw the first time, but then the next turn you're threatening to pull a fistful of cards and access a bunch. It's an extremely powerful effect that's mitigated by the set up: you have to be able to access a bunch of cards (e.g. be winning already), Obelus' 4 cost is nothing to shrug off, & just one MU isn't that great either in a faction that's notoriously strapped for memory, so much so that MemStrips is a card that's seen play. Overall I think this card has two incredibly interesting abilities that are somewhat hard to take advantage of. 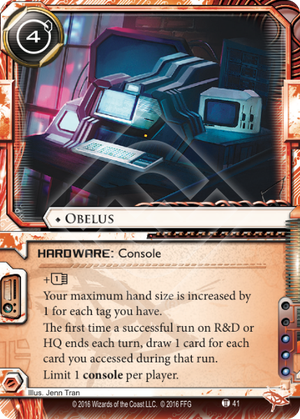 In the right deck, Obelus is very powerful, but it's nowhere near as general-purpose as Turntable or Grimoire, which will likely continue to be the go-to console choices for Anarch.